“You can’t question how the machinery works. If it works in your favor, why question it?” (Kindle Locations 1624-1625). Philip Dunbar has not a care in the world. He’s about to graduate, but he doesn’t yet have a job. In the next couple of months he will realize how tough it is to get a job in this economy. After finally lucking out and getting a job, Philip will realize it’s not all sunshine and roses and even working hard sometimes gets you nowhere. So why work hard? Philip will continue to get lucky, even though he hasn’t been serious about his sales or his efforts at work. Even after climbing up the job ladder, Philip will come to realize that prospects from the top or not all that different from those at the bottom. I loved the start of the chapter quotes. 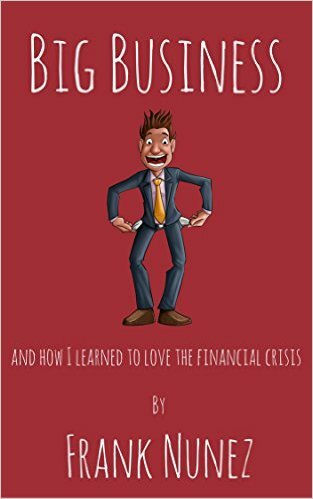 They were quick to orient the reader and bring in the outer world into this narrow viewed story of Philip Dunbar and how the financial crisis of 2008 affected him. As much as I disliked Philip Dunbar, I also couldn’t help but want to know how his story would end. Throughout the story, Philip grew and became a much more likeable fellow than he started. He even had some redeeming moments. This story was told from Philip Dunbar’s point of view and it was like reading “dude” lit. The plot meandered but the story was fascinating. The pacing was a bit choppy. The scenes were a bit choppy. Philip Dunbar’s perspective was rather choppy. There were a lot of missing visuals, a lot of the scenes read like in they were a screenplay. Many dialogue tags were withheld. Much of the action was summed up by the narrator instead of shown through the scene. There were fewer details than summations. Some of the humor felt awkward, but the narrator’s voice was entertaining and approachable. There were also enough instances of typos/grammar errors to bring my attention away from Philip to focus on the mechanics of the novel. This novel was published by Amazon Digital Services December 29th, 2015 and is available on Amazon here.